ANSEW INTERNATIONAL are professional chemical supplier since foundation of 2007. With company principle"Responsibility,Reputation and Service", we serve customers and partners in almost all countries of the world. Accompanied with a continuously-increasing and developing business, we succeed to enhance MAGNESIUM SULFATE to 25, 000 ton annually. Packing: In pp bags, 25kg net. 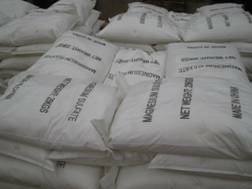 Application: As a main materials in fertilizer.also can be used in stockfeed additive leather, dyeing, pigment, refractoriness,ceramic,marchdynamite andmg salt industry. Copyright © 2007 by AnSew International Co.,Limited, All Rights Reserved.